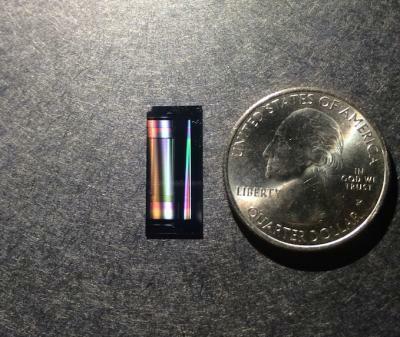 Photo of chip from Hong Tang’s lab, compared in size to a quarter (colors in chip are photographic artifacts). Picture courtesy of Xiang Guo. Yale engineers have developed a new device that converts visible light to infrared light suitable for fiber-optic transmission without destroying the light’s quantum state. The lab of Hong Tang, Llewellyn West Jones, Jr. Professor of Electrical Engineering & Physics, has developed a device that converts visible light to infrared light, a crucial step in building practical quantum information technology. The results of their work were published recently in Physical Review Letters. Built on a chip, the wavelength converter would allow for the manipulation of quantum bits and the transmission of that same information over long distances. The device has the potential to be built on a scale required for quantum computers as the technology advances. “People want to use short wavelength photons – like 700 to 800 nanometers – to do quantum computation,” said Xiang Guo said, a graduate student in Tang’s lab and lead author of the article. But if they want to transmit that information over a long distance through optics fibers with low loss, they need to convert the photons to longer wavelengths of about 1,500 nanometers. And when it reaches its destination, the photon needs to be converted back to the shorter wavelength. When lasers send two wavelengths of light into the device, the converter generates a third frequency that acts as a kind of middle ground between the two. The device is made from aluminum nitride, which is key to the device’s success. “We managed to make it very low loss, while retaining the nonlinearity,” Guo said. Their lab had started using the material five or six years ago, but found that it was very lossy – that is, quantum information was lost in the transmission. The team improved the material quality, which made it more transparent to light and reduced the loss of photons scattering at the boundary of the device. Guo said the device has achieved a 14% conversion rate. He said the research team’s next step is to work more on the device and improve its conversion rates. “We want to increase it all the way to 70%, or even 90% or 100%,” he said. Be the first to comment on "Yale Engineers Develop A New Chip That Could Advance Quantum Technology"